In this volume we explore the underbelly of Orario, the red light district! 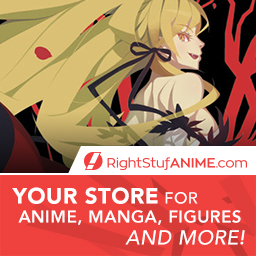 Prostitution, human trafficking, and…cute fox girls? 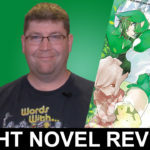 Having triumphed in the War Game, Lilly, Welf, and Mikoto have forged new bonds with each other and with Bell, and the new-and-improved Hestia Familia is feeling distinctly more familial. But when Bell has to venture into the pleasure quarter of Orario to come to Mikoto’s aid, he’s soon tangled up in more intrigue than he bargained for. Ishtar Familia owns the night here, and none of Bell’s experience can prepare him for their courtesan wiles! A War Game–an all-out proxy war between gods, and the winner takes all. But what is it that Apollo wants? Hestia’s beloved Bell Cranell, of course! With a week to go until the Game, things are bleak enough, but then Lilly is kidnapped by the Soma Familia. The outlook isn’t good , but Bell has made many friends through his adventures, and they won’t stand idly by. The familia mythcontinues! 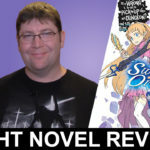 Bell, along with his adventuring party of Welf the swordsmith and Lilly the supporter, has made it into the middle floors of the Dungeon, but the schemes of another party have stranded them there! Hestia’s going to need to send help, but will the rescuers arrive in time to save Bell and his friends from the monster that’s got them cornered? The familia myth of the boy and the goddess continues! 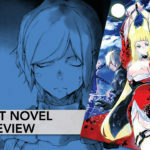 Review of the 2nd volume in the light novel series, Is It Wrong To Try To Pick-Up Girls In A Dungeon? 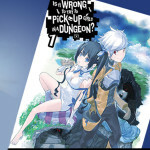 (aka DanMachi) by Fujino Omori. “Nice to meet ya, white-haired mister!” When someone calls out to Bell with these words, he discovers that the voice belongs to a small girl, who introduces herself as Lily, a supporter. 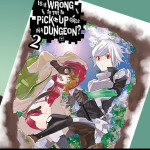 Somewhat goaded into teaming up with her despite the many doubts running through his head, Bell has a successful turn in Dungeon with his new companion. Though their alliance is short lived, the negative rumors swirling about the guild to which Lily belongs, the Soma Famiglia, are anything but. And then there’s the ale they sell, said to steal the hearts of all who drink it–!? 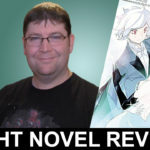 My book review of Volume One of Fujino Omori’s light novel series, Is It Wrong to Try to Pick-up Girls in a Dungeon?